– There’s something about worms in Upstream Color. …What did I just watch? Well, let’s start with the plain details. Upstream Color is Shane Carruth’s second feature film. This is the man who debuted with Primer; a dense, confusing time-hopping film about two guys who create a rudimentary time machine in their garage. That film was so complex it had to be explained by using a flow chart. Upstream Color is something very, very different however. Primer had a plot that could be quantified, whereas Carruth’s latest offering is ephemeral and resists being pinned down. It is soundtracked with a booming, beautiful ambient score and the cinematography is mostly comprised of discreet close-up shots often with pauses and black-screens between segments. Close-ups of leaves, riverbeds, faces, floors, books: this is certainly a film that must be watched in high quality. But what is it actually about? Well, I shall describe the opening of the film but go no further. 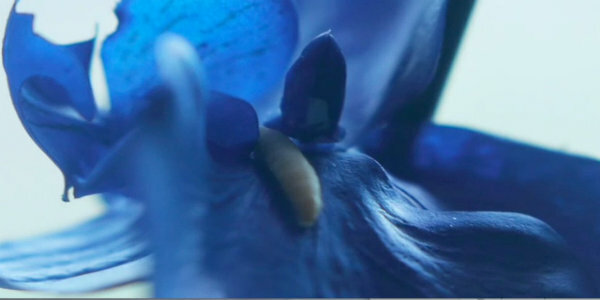 We see a man (Thiago Martins) buying plants from the garden centre and scraping a strange blue residue off their leaves. We see him collecting worms from the plants’ soil and running a strange liquid over them. We see children drinking this liquid and becoming able to harmoniously synchronise their body movements with one another. The man puts the worms into capsules and attempts to sell them as drugs outside a club. Failing to receive any customers…he tasers a woman (Amy Seimetz) and force feeds her a worm. The worms have a scopolamine-like effect, making the woman completely open to suggestion. He instructs her in all kinds of maxims, and eventually dupes her into mortgaging her house and leaving him all of her savings. We are only ten minutes in here, but this shall suffice to talk about some of the themes of the film. Needless to say, it gets all the weirder, but the backbone of the film is actually a heartfelt love story between Seimetz’s character and Jeff (played by Carruth himself). The couple are visited by uncontrollable bouts of emotion that affect their everyday lives and we are invited to speculate as to why these impulses occur. Upstream Color is essentially a film about free will and offers a bizarre model for how external forces affect our lives. There is plenty of metaphorical guesswork to be had here, and in fact, the film becomes hard to follow without considering some events as metaphors. This is not a film for those who want concrete answers and will certainly be very boring and displeasurable to some. I was left feeling completely aimless in the middle of the movie, but fortunately the threads started to come together (very tenuously, but at least it’s something) towards the end.